The London 2012 Olympic Games turned this corner of East London into a fairground of wonderment and activity. The long-promised Stratford City Project, launched in the late Nineties to regenerate the East End, quickly became a reality. This new development rose out of the ground in just seven years, forming a metropolis of accommodation, stadiums and retail offerings. As the crowds dispersed and the Olympic torch faded, London was promised that with this huge investment into infrastructure, architecture, technology and sport, would come a lasting legacy – and ‘legacy’ soon became a buzzword for the entire development. How do you create a space with a legacy, forming its own, discrete identity, separate to the one that brought it into being? How do you produce spaces that are more than just a product of the Olympics, but retain that legacy at their core? In the park exists a list of iconic structures that are symbolic of those six short weeks in 2012: Anish Kapoor’s ArcelorMittal Orbit, Populous’s Olympic Stadium, Zaha Hadid’s Aquatic Centre and Hopkins’ VeloPark. Although now proving useful to a new community, they are still embedded in the London 2012 Games. The vast athletes village, now named East Village, is yet to take on a sense of neighbourhood that the name ‘village’ might suggest. Street names such as ‘Cheering Lane’, ‘Celebration Avenue’ and ‘Victory Square’, imply the area is still cemented in and reliant on its history, but the streets remain profoundly placeless in character. But in the North East corner of the Queen Elizabeth Olympic Park exists a different beast altogether. The London Olympics Media Centre, a so-called ‘landscraper’, provided more than 100,000 sq m to host the world’s media, press and broadcasters during the Olympic Games. 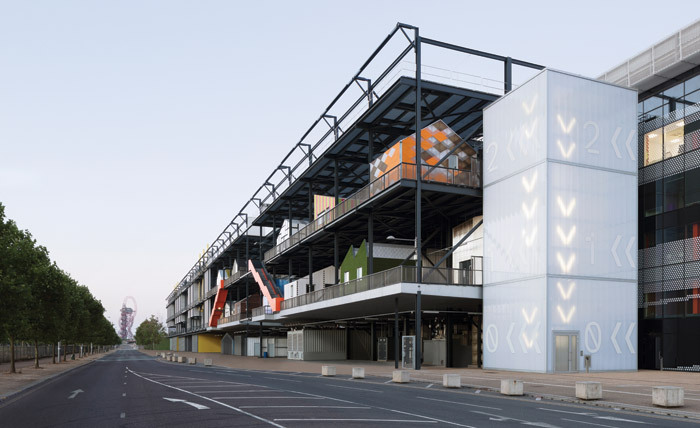 When the Games were over, the series of open-plan warehouses presented a blank canvas on which the Olympic legacy could be painted. Continuing in its image as a technical hub, the complex has been transformed into an innovation hub for the creative tech community, renamed Here East, by Hawkins\ Brown. 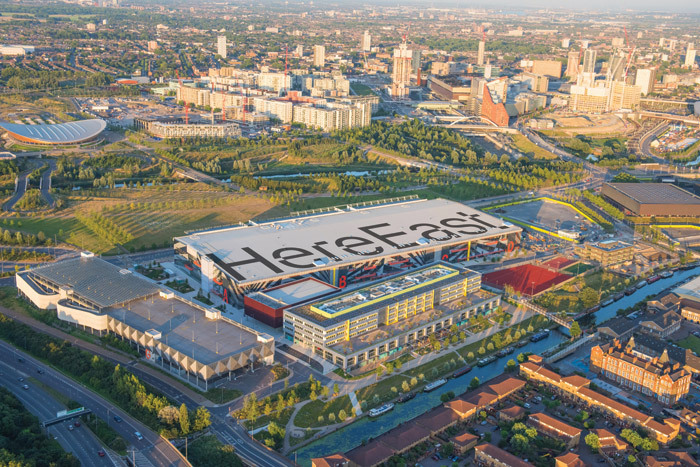 Although still unavoidably ‘new’ and not yet grounded in its evolving context, Here East is achieving the sought-after balance between an Olympic legacy and a fresh future. Offering space for universities, established business, start-ups and artists alike, Here East has recently opened its affordable artists spaces, The Gantry, fulfilling its Section 106 commitments and completing the community with diverse innovators, makers and educators. Fixed to the back of the Broadcast Centre, a full-height steel gantry was used to carry air-conditioning units during the Games. 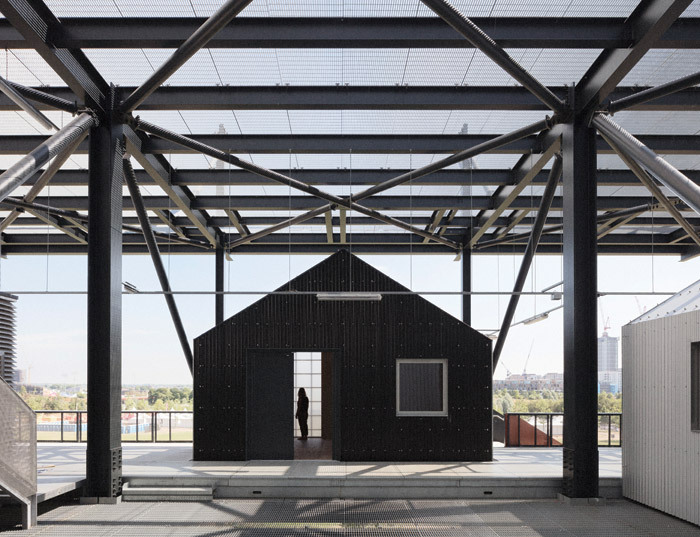 As these were stripped out, a steel grid was left on to house the artist’s studios. Hawkins\Brown, in collaboration with Architecture00 (creator of WikiHouse) has reimagined this purely functional steel structure as a ‘cabinet of curiosities’. In recognition of the myriad makers and inventions that evolved out of the Hackney Wick area in the 19th and 20th centuries, individual studios are imagined as a tribute to the creations. A pattern of salmon-coloured and clear corrugated plastic scales cover the side of one studio, in reference to London Cure Smoked Salmon’s Hackney Wick origins. On another, a corrugated steel inner emerges from a translucent yellow shell, reminiscent of the area’s Lesney Matchbox Toy Factory. Each studio and its respective meaning announces itself on the facade, building a complete story of the rich history of making in East London – but perhaps none more so than the Clarnico Confectionery-inspired studio. Bold candy coloured stripes help to bring the facade alive with another layer to its meaning. This detailed and contextual approach leaves within it space for the studios to evolve and come part of the landscape. Certain studios are left blank, with simple hooks in the corners. These are intended to be adorned by the resident artists and makers, as the facade evolves into a complete timeline of makers in the area. Hawkins\Brown has created a framework for a piece of architecture and it is the inhabitants that will build it. In realising this ‘cabinet of curiosities’ framework, a series of discreet structures was necessary. This is where Hawkins\Brown’s collaboration with Architecture00 became integral to the project. With its BETA project, WikiHouse, it is seeking to reinvent the way we design and construct. WikiHouse is an open source platform that uses parametric coding tools to fabricate modular timber panels. Each of the 23 units were CNC-milled offsite and fitted together at The Gantry. The construction process was quick and easy and allowed for units to be fully customisable at the design process without the need to draw up detailed designs for each unit. Invaluable as a design and construction tool, the process facilitated a mix of single-storey and duplex units with varying roof profiles, providing a range of studio spaces to suit different makers’ needs. 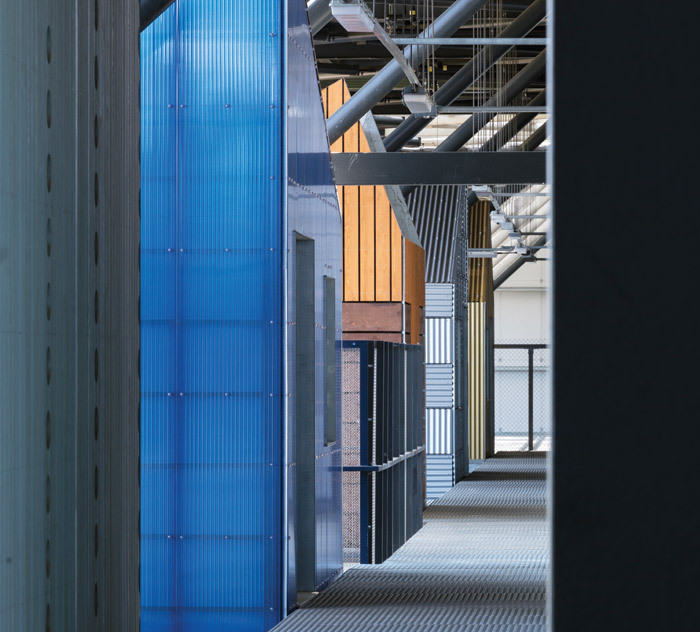 On a visit to The Gantry in mid-September, before the prospective tenants had begun to inhabit the new studios, Here East was already forming a thriving, collaborative community and The Gantry was the last piece of that puzzle. In a development largely dictated on form and use by a six-week event over six years ago, it is refreshing to see a scheme that takes the familiar buzzword, ‘legacy’, but gives it a whole new meaning. In a corner of the park where the legacy use was arguably less ‘locked-in’ to the planning and design of the architecture than, for example, the athletes’ ‘hotels’ turned residential units, Hawkins\Brown has taken a space implicit in use and created something useful to the new community. An innovation hub can seem like a wildly unobtainable, impenetrable entity to someone just starting out. The Gantry provides the first step on that ladder – or rather steel, gridded gantry. Scaling the wall of the main campus, the architecture makes manifest the Here East vision – providing spaces for people to learn, innovate and grow, The Gantry being the place to start. In doing so, the design both grounds itself in its context, in East London’s prolific history of making and leaves a space for its inhabitants to display their future.